Constable, a name that is synonymous with our idealised image of the English countryside, is not all that he seems. Firstly, he was a rebel, pioneering new ideas, styles and methods throughout his career. Because of this he did not fit into the Royal Academy’s pedagogic view of art history, choosing lowly landscape as his chosen subject matter his works were criticised as being sloppy and unfinished. Secondly, he was as much a meteorologist as an artist, investigating weather and its effects with scientific observation. Prominent figures in science such as Herschel and Howard were formulating new theories about weather, keeping diaries and logbooks to a high degree of detail. Books such as The Theory of the Origin and Modification of Clouds published in 1832 is on display in the gallery, giving a glimpse into the academia of the pursuit. The oil sketch on display near by ‘Study of Sky and Trees’ is such a raw and energetic piece, with the tumultuous clouds and the verdant green of the tree tops, I can almost feel what the temperature and air was like at that precise moment in time. The daubs and dashes of paint in various states of transparency give the scene movement, creating a breeze and sound of rustling leaves. 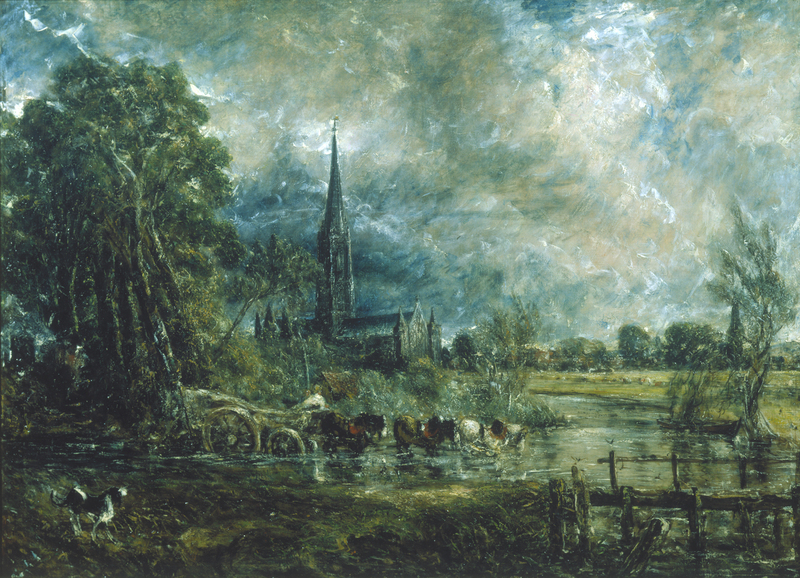 The scientific discoveries being made infiltrated both art and literature, Shelley and Goethe being among the writers inspired by the spirit of enlightenment as Constable was, tying ideas of the force of nature into Romanticism, such as the sublime. Weather being linked to good health was being promoted, fresh air was particularly valued as having restorative benefits. Constable’s wife, Maria, continually suffered with a weak constitution, further worsened by her seven pregnancies, so breaks from the city would have been a relief to her. Hampstead Heath was a popular destination in the nineteenth century, it’s green hills and unspoiled woodland provided a refuge from London’s notoriously dirty air. During the time the artist and his family spent there in the summer of 1819, Constable painted its landscape numerous times. Branch Hill Pond (1819) shows his continuing fascination with the visual effects of weather, but I think here the emphasis is on sun coming through the clouds. The way he paints shafts of light almost smudging their way through the thickly clouded sky is beautiful. The contrast between the dirty grey clump on the left and the lighter white clouds on the right feels that there is a depth and movement to the sky, as though it is clearing. The tiny figures in the painting are mere daubs of colour, serve as a measurement of scale to the vast landscape, the reflection on the water as a mirror to the sky. Here the clouds are full of structure, they aren’t the light fluffy, whipped white of Constable’s early skies. The paint is dense and impastoed, creating a rocky surface. The colours in the sky are turbulent, quite unnatural, they remind me of El Greco’s skies. Salisbury cathedral, a vast stone edifice, looks measly here. It is dwarfed by the sky, overshadowed by the enormous rolling clusters of clouds. I feel that the figures below, a horse and cart, a driver and a dog, should hurry home, surely a storm is coming. Constable painted the land and nature, but more notably he was a painter of air and water. To him, painting and feeling were one and the same; elemental, subject to change and able to cause great effect. But he also believed that painting was a science, and so the three concepts form a sort of holy trinity. He was a very modern man, bold in his ideas and innovatory in his techniques. 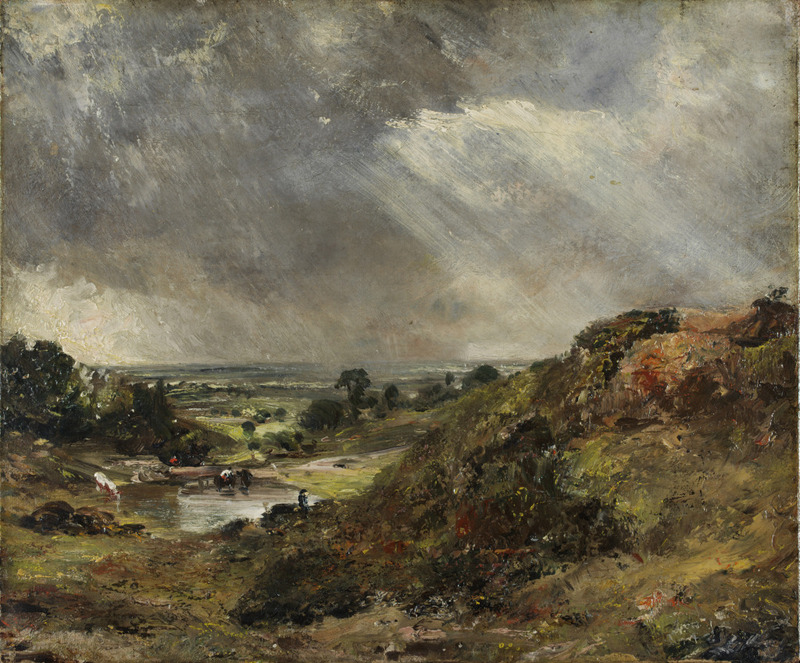 The English landscape, while loaded with subjective meaning could be a vehicle to express love and memory for a time and place, but also as a visual record of the phenomenon of weather. Constable was romantic and philosophical in his approach to the landscape, it was a personal thing. He very poetically said of himself ‘I am a man of clouds’. 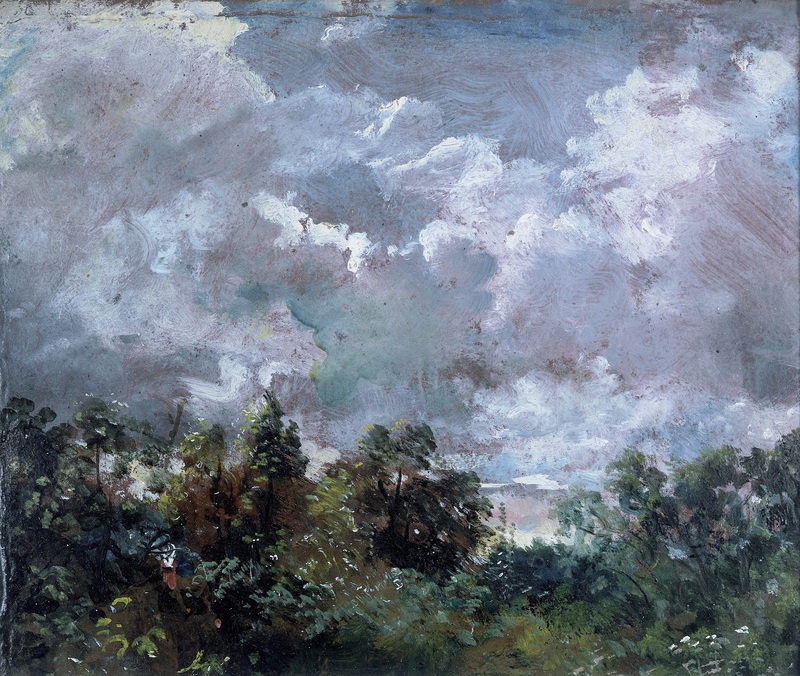 I think that although he enjoyed painting his surroundings (particularly his beloved Suffolk) he was fascinated by the science of the weather. His detailed observations of light and the effects it has on the landscape were unprecedented. To Constable weather was truth and fact, all-encompassing and eternal. ‘The world is wide. No two days are alike, or two hours’. There may be just ten types of cloud, but no sky is the same.